Template attacks have been considered exclusively in the context of implementations of symmetric cryptographic algorithms on 8-bit devices. Within these scenarios, they have proven to be the most powerful attacks. In this article we investigate how template attacks can be applied to implementations of an asymmetric cryptographic algorithm on a 32-bit platform. 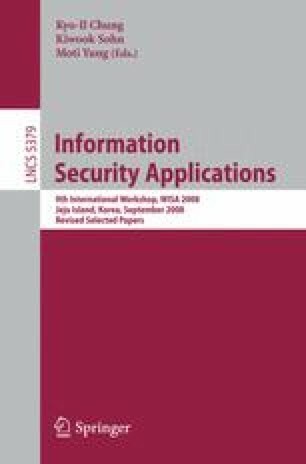 The asymmetric cryptosystem under scrutiny is the elliptic curve digital signature algorithm (ECDSA). ECDSA is particularly suitable for 32-bit platforms. In this article we show that even SPA resistant implementations of ECDSA on a typical 32-bit platform succumb to template-based SPA attacks. The only way to secure such implementations against template-based SPA attacks is to make them resistant against DPA attacks. The work of the first author has been supported in part by the Austrian Science Fund (FWF) under grant number P18321 and by Secure Business Austria (SBA). The work of the second author has been supported in part by the EPSRC under grant number EP/F039638/1.